Home � Disney World Vacations , Epcot , Epcot Festivals , Epcot International Festival Of The Arts � Epcot International Festival Of The Arts - Review of the Food! 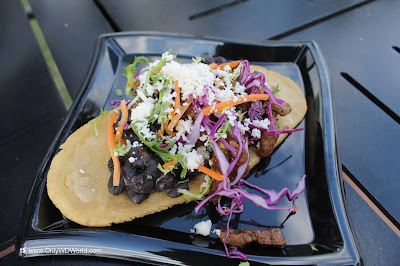 Epcot International Festival Of The Arts - Review of the Food! 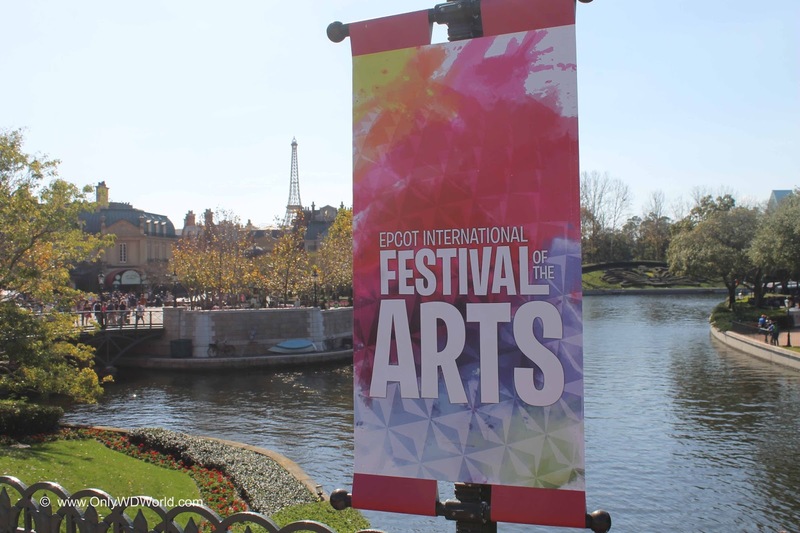 Disney World has a new festival to kick off 2017 with the inaugural edition of the Epcot International Festival Of The Arts. During 6 weekends from January 13 - February 20 Epcot pays homage to the Arts : Visual, Musical, and Culinary. 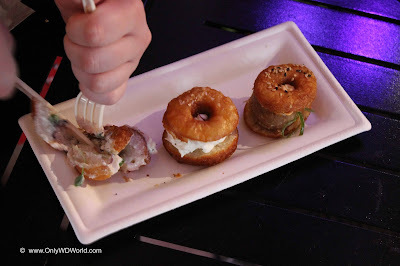 As a big fan of the Epcot International Food & Wine Festival and the other events that have added food stations and kiosks over the past few years, we were excited that this festival was also going to add 8 different Food Studios with a variety of artistic culinary creations that have not been part of previous Epcot offerings. During this Only WDWorld review we rate and rank 11 of the dishes that we tasted at this year's festival. This is but a sampling of the over 40 Festival Food offering and the many special drinks (both alcoholic and non-alcoholic). We will rank the ones that we tried in reverse order from #11 working our way up to #1, so read through them all or scroll to the bottom to find out which ones were our favorite. Don't worry, we've included pictures of each of them! This dish from the E=AT^2 Food Studio had a lot of promise, but we were not impressed with the final result. The waffle crisp was actually a waffle sandwich with a layer of caramel in the middle which unfortunately becomes hard as a rock when inserted into a frozen shake and become very difficult to eat. The ingredients sounded amazing, but the final result was underwhelming, not awful, but it ranked the lowest of all the dishes we tried. Honestly, this dish was one that we selected before our visit as one that we MUST try. Again we were not impressed. 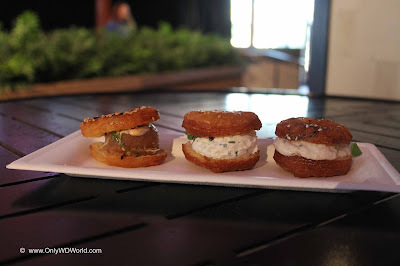 The 3 Croissant Donuts each had a different savory filling: Whipped herb cream cheese with sea salt; Chicken mousse with fresh herbs and Everything bagel seasoning; & Spicy tuna with sriracha mayonnaise and sesame seeds. The chicken mousse was so flavorless that we thought it was the herbed cream cheese. The other main challenge was that the Croissant donuts were incredibly difficult to bite into without squirting the filling everywhere. Lastly, this was served at the Painter's Palette inside the Odyssey Festival Showplace. The plates were made up ahead of time and we missed out on some of the presentation process that made the other dishes so great. 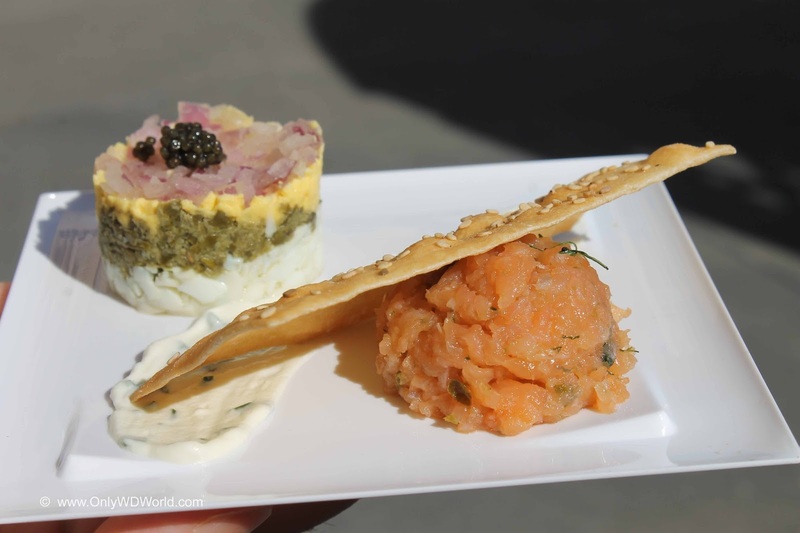 The smoked salmon could be found at the Masterpiece Kitchen located in the Canada Pavilion. At $12 this was one of the more expensive dishes that we sampled. Although we love sushi and salmon, this beautifully presented dish did have the flavors required to make it stand out. It was really good, but certainly not great. It is a very impressive looking dish, but after eating it we were left hoping for more memorable flavors. At the Artist's Table near the American Adventure we sampled this artistic take on comfort food with pork, carrots, potatoes topped with a red wine sauce. 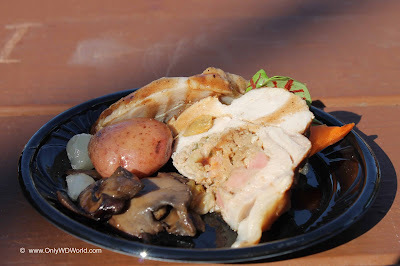 From this dish on up through #1 is where we really noticed the difference between the food at this festival versus the others at Epcot. There was a significant emphasis put upon creating an edible piece of art and each part of the dish was carefully and individually placed upon th plate in a specific manner to deliver the desired artistic rendering. Although the ingredients indicate comfort food the flavors indicated that this was well beyond the typical that we were enjoying! Found at the El Artista Hambriento (The Hungry Artist) located in the Mexico Pavilion was this incredibly tasty piece of art. Consisting of flank steak, black beans, salsa de Chile de Arbol, Frisee lettuce, Queso Fresco, Red Cabbage, Shredded Carrots, and Chipotle mayonnaise on grilled corn dough, this dish tasted as good as it looked. The steak was plentiful and the flavors of all of the ingredients worked well together to make a well executed dish. 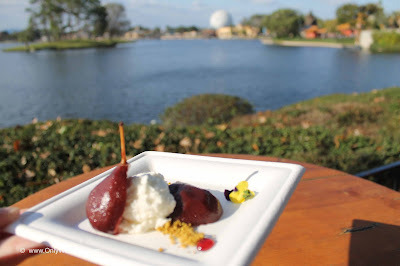 We discovered this enticing dessert at the Cuisine Classique Food Studio in the Germany Pavilion.The port-wine poached pear was combined with vanilla panna cotta, pistachio crumbs and a pansy flower. This dessert had it all, good looks and tantalizing flavors! 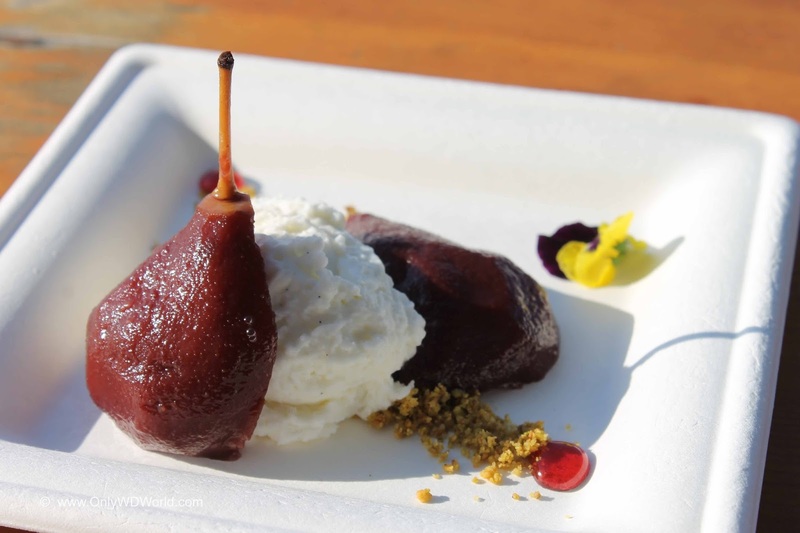 Even non pear lovers will find this dessert amazing The combination of pear, panna cotta, and pistachio worked really well together. Short rib may be a trendy ingredient these days, but this piece of art from the Cuisine Classique Food Studio had incredible flavors to enjoy besides the attractive presentation. 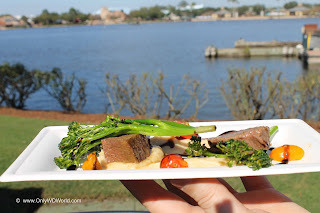 The Braised short ribs was combines with parsnip puree, broccolini, baby tomatoes, and aged balsamic. Every bite was amazing! We have to admit that we were a bit leary about this one. Visually this is one intriguing dessert. The purple is supplied naturally from the use of purple sweet potatoes. 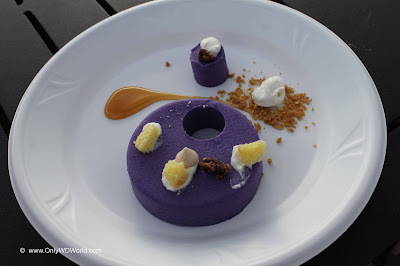 Found at the Decadent Delights Food Studio near the entrance to the World Showcase this wild looking dessert combines purple sweet potatoes, salted caramel, bourbon soaked cake, and marshmallow whipped cream. The perfectly balanced flavors were a complete surprise. This dessert is so much more that its shocking purple color. Definitely a MUST try! Fans of Le Cellier and their famous mushroom fillet are not strangers to the incredible wild mushroom risotto that they offer. 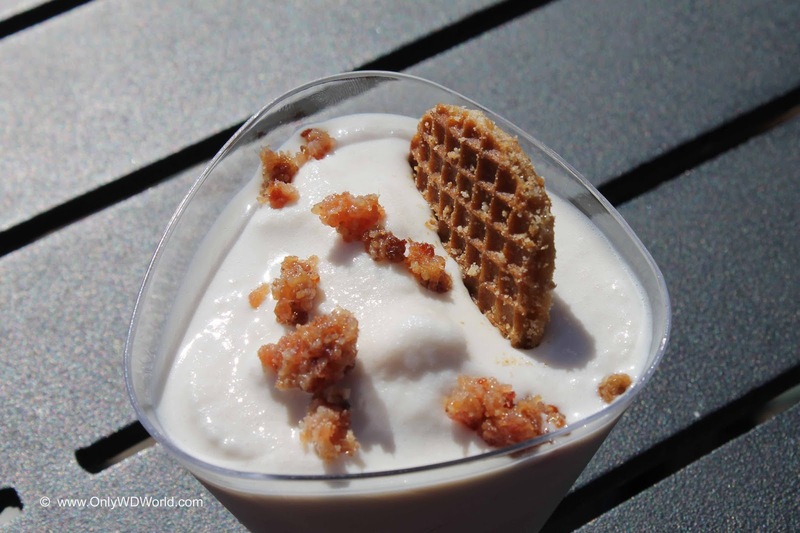 I would dare to say that this stand alone rendition offered at the Masterpiece Kitchen in the Canada Pavilion is the best ever! The combination of wild mushroom risotto, aged parmesan, truffle shavings, ad zinfandel reduction carefully assembled one cup at a time results in true "Wow Factor!" when it comes to flavors. Do not pass over this amazing dish, you will regret it! When it comes to discovering a combination of flavors that go perfectly together this dish takes the prize. 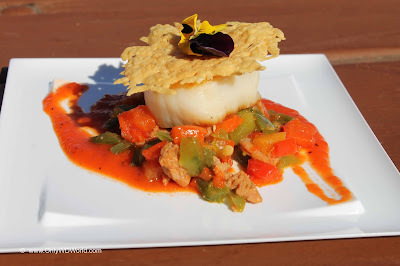 The beautifully presented scallop dish at The Artist's Table in the American Pavilion almost could be topped. The pan seared scallop is served on a bed of chorizo and roasted pepper coulis and topped with a parmesan crisp. Each one is carefully assembled by a culinary artist with exacting care. We didn't think it could be beat until we tried the eventually #1 dish! A re-imagined interpretation of a BLT does not sound like a grand prize winning dish, but for us it was, narrowly beating out the pan seared scallop. This BLT consists of crispy pork belly, tomato jam, and a soft poached egg expertly assembled at the E=AT^2 Food Studio. This dish quickly went from something that sounded intriguing to a dish we couldn't get enough of. The flavors complemented each other well and the appearance was a true work of art. 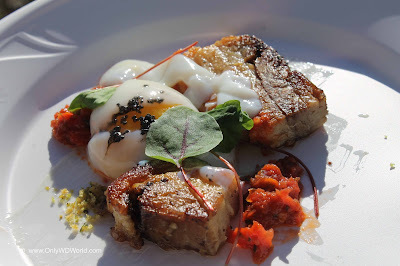 The chefs carefully assembled each one to get the look just right and to make sure the soft poached egg was intact in its perch atop the pork belly. Disney World may have a new fan favorite with the Epcot International Festival Of The Arts. Not only did it deliver with a wide array of visual arts to see and an impressive Broadway themed night time concert, but the food was a big hit. By bringing new dishes created just for this festival and not rehashing the same Food & Wine Festival tapas, Epcot has created another reason to visit during the Winter season. Well done! 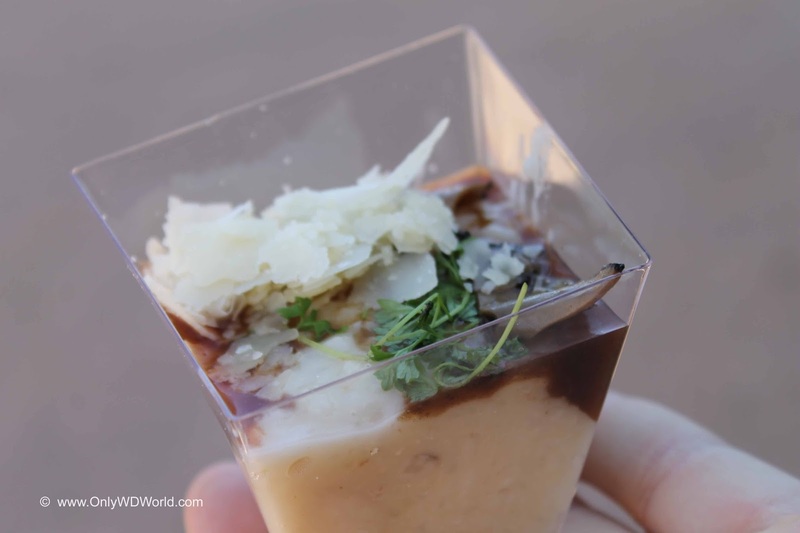 0 comments to "Epcot International Festival Of The Arts - Review of the Food!"